Proper lighting is essential to capturing the perfect shot, and sometimes your camera's built-in flash just won't cut it. Fujifilm's EF-42 shoe-mount flash puts more light at your disposal than your camera's built-in flash, so you can take shots from far greater distances in dim settings. It works easily and automatically with your Fujifilm camera to deliver precise illumination that can greatly extend your shooting range, reveal stunning detail, and add drama to your images. The EF-42's flash head can be tilted and swiveled to place just the right amount of light where you want it. This also lets you bounce light from walls or ceilings to provide softer illumination with less glare and fewer shadows  ideal for flattering portraits and large group photos. The flash head even extends and retracts to change the angle of lighting for better coverage with wide-angle shots. For use only with compatible Fujifilm cameras. Requires 4 "AA" batteries (not included). 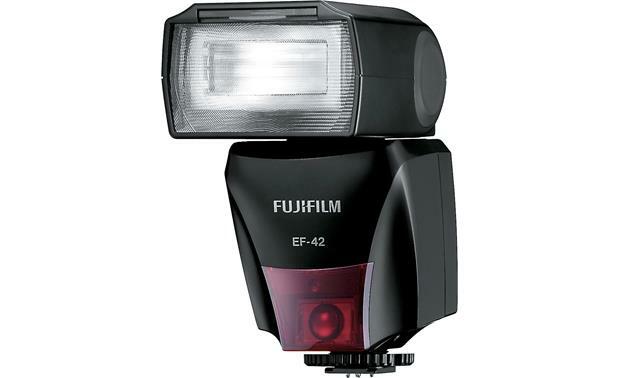 Overview: The Fujifilm EF-42 is a shoe mount flash unit for use with Fujifilm cameras equipped with an accessory hot shoe, including the FinePix X100 and FinePix HS20. Bounce Flash: The EF-42 can be used for direct flash (0°), pointed upward for bounce lighting off a ceiling, and even rotated left or right for bounce lighting off a wall. Bounce flash can produce softer, more natural shadows in your photographs than direct flash. The light-emitting section of the flash can be aimed upward, with stops at 45°, 60°, 75°, and 90°. It can be rotated left up to 180° (with stops at 30°, 60°, 90, 120°, and 150°), and rotated right up to 120° (with stops at 30°, 60°, and 90°). Wide Panel: When using a wide-angle lens, the flash may not cover all of the area being photographed. In this case, the wide panel, located above the flash window, should be used to diffuse the light to a wider area. The wide panel makes the flash compatible with a focal length of up to 20mm. TTL Flash Photography: TTL (Through-the-Lens) flash control automatically adjusts flash output for optimal brightness. The flash also responds to changes in camera settings, allowing the flash to be used at shutter speeds slower than the flash sync speed. Manual Flash Photography: Manual flash control is unaffected by reflections, making it ideal for pictures of highly reflective or unreflective subjects. You can make adjustments using the LCD panel. Adjustable Flash Output: You can manually adjust the output level of the flash as follows: Full (1/1), 1/2, 1/4, 1/8, 1/16, 1/32, or 1/64. Exposure Compensation: You can manually adjust the exposure compensation in 7 steps from -1.5 EV to +1.5 EV. LCD Panel: The LCD panel can indicate numerous modes including focal length format (35mm or Digital), Exposure Compensation (Positive or Negative) values, Zoom mode (Auto or Manual), and Power Ratio. It also has an integrated flash range indicator scale. You can use the Mode button to select the setting to adjust and the Select button to choose the desired option. Test/Charge Lamp: The Test/Charge lamp lights steadily whenever the flash is ready to fire. Pressing the lamp activates a test firing. Auto Power Off: If no operations are performed for 15 minutes while the flash is on, the displays will turn off and the flash is disabled. Pressing the camera's shutter button halfway or turning the flash on and off will restore the flash's normal operations.